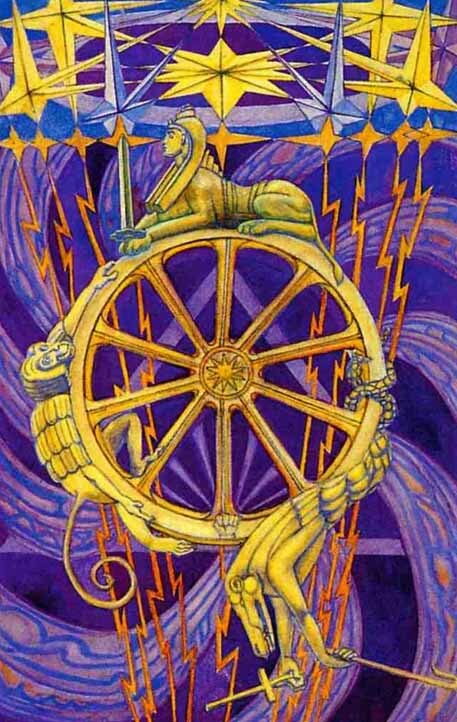 Wheel of Fortune, the tenth Major Arcana of the Tarot, remembers the ancient and medieval philosophical concept of Rota Fortunae – the wheel of the goddess Fortuna. The medieval collection of poetry „Carmin Burana“ expresses very clear the meaning of this concept: „The wheel of Fortune turns; I go down, demeaned; another is carried to the height; far too high up sits the king at the summit – let him beware ruin! for under the axis we read: Queen Hecuba“. The divinatory meaning of Wheel of Fortune is, according to A. E. Waite, expressed by the following words: „ destiny, fortune, success, elevation, luck, felicity“. 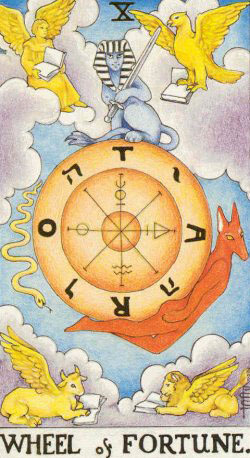 Reversed, Wheel of Fortune indicates: „increase, abundance, superfluity“. 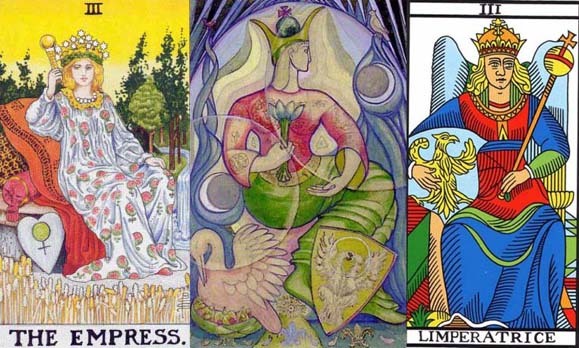 The esoteric interpretation of this Major Arcana is that of „stability amidst movement“. This is the explanation given for the essential elements of the card: „the symbolic picture stands for the perpetual motion of a fluidic universe and for the flux of human life. The Sphinx is the equilibrium therein. The transliteration of Taro as Rota is inscribed on the wheel, counterchanged with the letters of the Divine Name – to shew that Providence is imphed through all“. 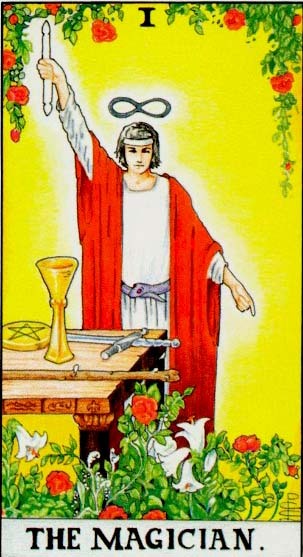 For P. D. Osupensky, the name of this Major Arcana is „The Will of Chance“. „«All go, all return», – the wheel of life ever turns. All die, all flourish again,–the year of existence runs eternally. All perish, all live again, the same house of existence is ever building. All separate, all meet again, the ring of existence is ever true to itself. Existence begins at every moment. Round each «here» rolls «there». The middle is everywhere. The way of eternity is a curve“. 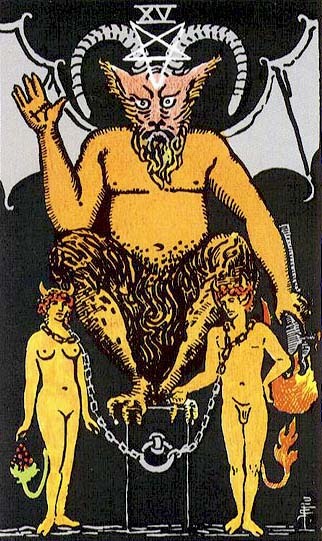 Crowley connects the Emperor with the Hebrew letter Kaph and with the planet Jupiter, „the Greater Fortune” in ancient astrology. The fundamental meaning? „This card thus represents the Universe in its aspect as a continual change of state“. „And now I perceive that all these things are but veils of the wheel, for they all gather themselves into a wheel that spins with incredible velocity. It hath many colours, but all are thrilled with white light, so that they are transparent and luminous This one wheel is forty-nine wheels, set at different angles, so that they compose a sphere; each wheel has forty-nine spokes, and has forty-nine concentric tyres at equal distances from the centre. And wherever the rays from any two wheels meet, there is a blinding flash of glory. It must be understood that though so much detail is visible in the wheel, yet at the same time the impression is of a single, simple object“. 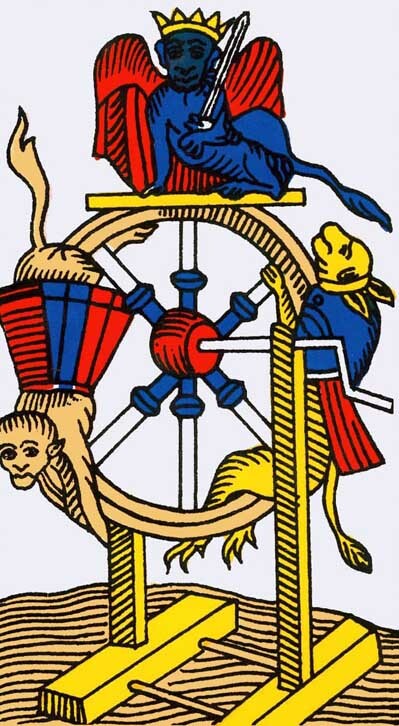 „It seems that this wheel is being spun by a hand. Though the wheel fills the whole Aire, yet the hand is much bigger than the wheel. And though this vision is so great and splendid, yet there is no seriousness with it, or solemnity. It seems that the hand is spinning the wheel merely for pleasure-it would be better to say amusement “. „It speaks: I am the greatest of the deceivers, for my purity and innocence shall seduce the pure and innocent, who but for me should come to the centre of the wheel. The wolf betrayeth only the greedy and the treacherous; the raven betrayeth only the melancholy and the dishonest. But I am he of whom it is written: He shall deceive the very elect“. „And I said: «By the word of power, double in the voice of the Master; by the word that is seven, and one in seven; and by the great and terrible word 210, I beseech thee, O my Lord, to grant me the vision of thy Glory». And all the rays of the wheel stream out at me, and I am blasted and blinded with the light. I am caught up into the wheel. I am one with the wheel. I am greater than the wheel“. The idea of Command, of Supremacy. The idea of the duration, of the eternal action of time“. „The first idea is expressed by the ternary, Anubis or positive, Typhon or negative, the balanced Sphinx the ruler. The second idea is expressed by the wheel, a line without beginning or end, the symbol of eternity“. „It represents the course of things according to the ternary law, which directs all the divine manifestations“. Reflex of the universal soul – Force Potential in its Manifestation. Share the post "Wheel of Fortune – Major Arcana Tarot Card Meaning, according to Waite, Ouspensky, Crowley and Papus"